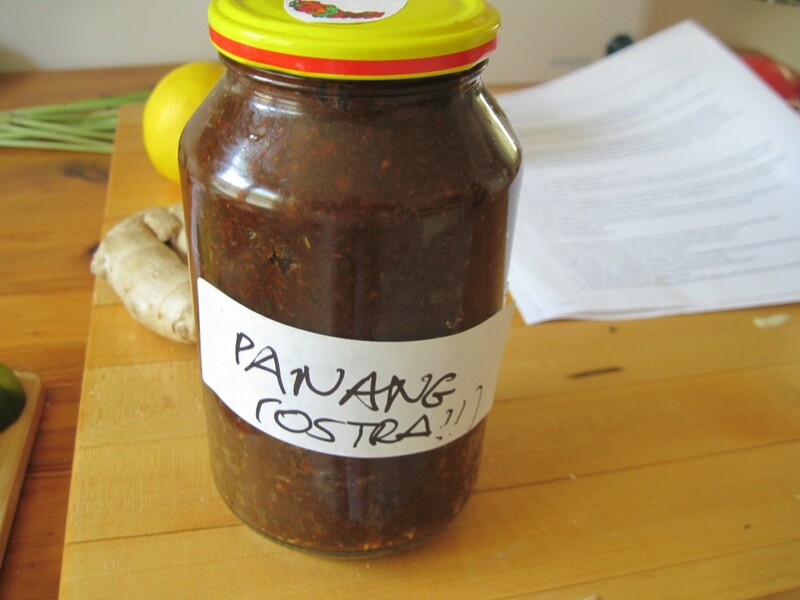 Panang paste is constructed out of many distinctive flavours held in a beautiful balance, with no single taste predominating. A Panang curry dish will be moderate in heat and will often contain crushed peanuts, which are very popular in Malaysian cooking. My interest in making this paste lies in preparation of the grilled chicken satay, which has held a significant position in our summer bbq parties. This paste, as its sibling massaman curry paste, are prepared in early summer with all the windows open, as the shrimp paste stench is hard for us, not accustomed, to bear. Once processed , all pastes are absolutely fantastic and became permanent residents of our refrigerator, used often and generously. So – make a lot at once, keep it in the clean and well sealed jar in the fridge – and enjoy. 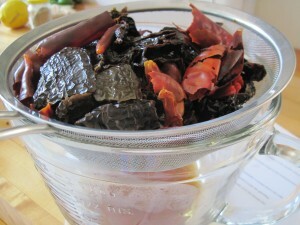 1,5 package (3 ounces or 140 g ) dried red New Mexico chilies or other moderately hot equivalent. I sometimes consult this good guide, if i have difficulty finding the exact chili. 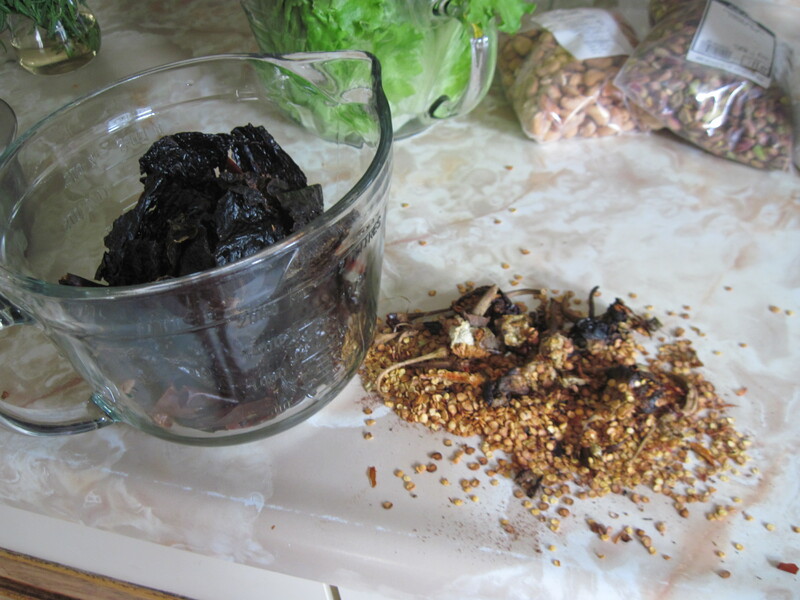 With kitchen shears or a chef’s knife, stem the chilies and shake out most of the seeds. 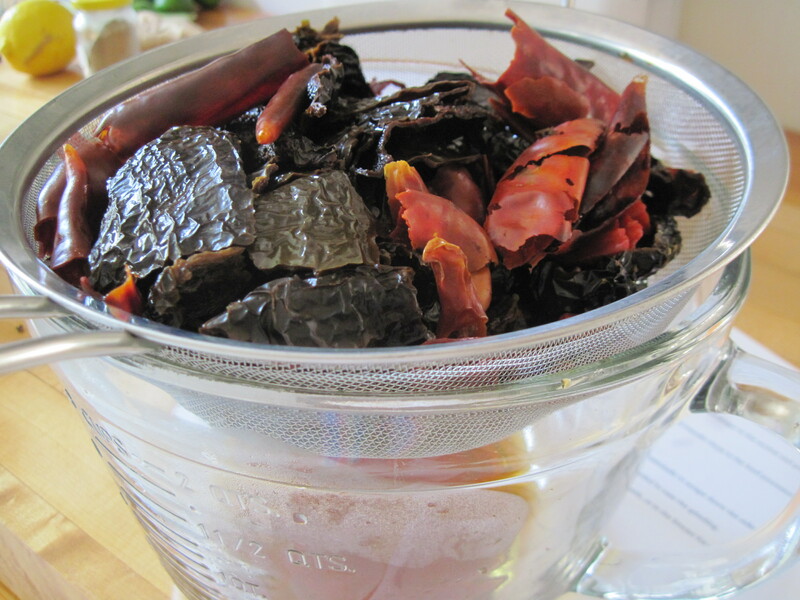 Cut the chilies in half lengthwise and remove any tough, dried ribs. Cut them crosswise into 3/4-inch pieces and put them in a bowl. Add water to cover and soak for 30 minutes. 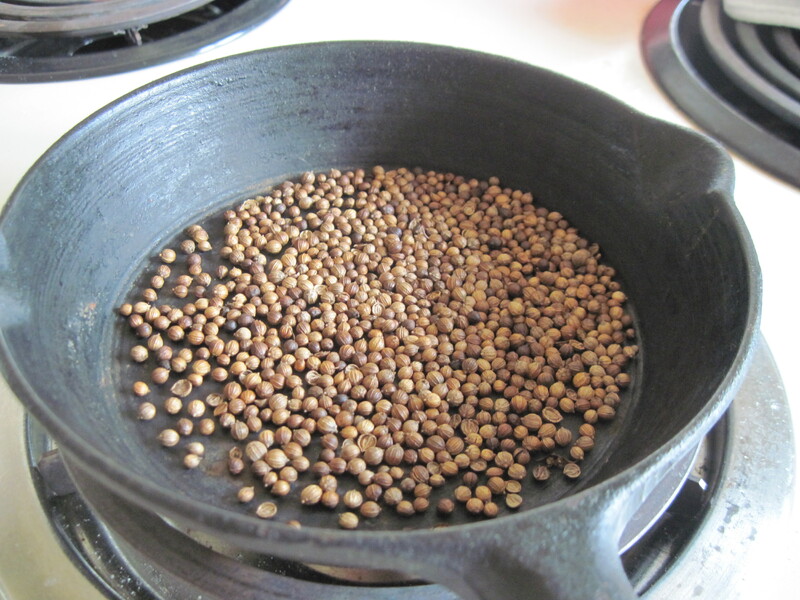 Meanwhile, dry-roast the coriander seed in a small skillet over medium heat for 3 to 5 minutes, until toasty and aromatic, shaking the pan often to prevent burning. 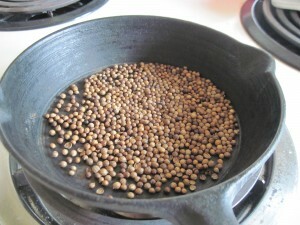 Transfer the coriander seed to a small bowl and set aside to cool. Set the skillet back over medium heat. 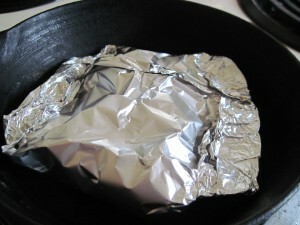 Place the foil-wrapped shrimp paste in the skillet and cook for about 5 minutes, until aromatic, turning the packet over once or twice. Put the roasted coriander seed in a large, heavy mortar and grind to a powder. Mince the peel and set aside. If using fresh Kaffir lime leaves, stack them and cut them into fine slivers with kitchen shears or a sharp knife. Combine the minced lime peel, lime leaves, cilantro, lemon grass, and ginger in the mortar and pound for a minute or so to break down the fibres. 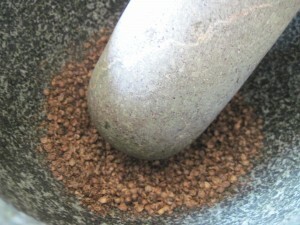 Transfer the crushed mixture to the food processor. 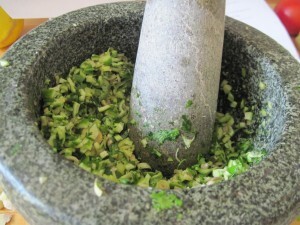 Pound the garlic and shallots in the mortar just until crushed and transfer them to the food processor. Unwrap the shrimp paste and add it to the food processor. Drain the chillies, reserving about 1/2 cup of the soaking liquid. 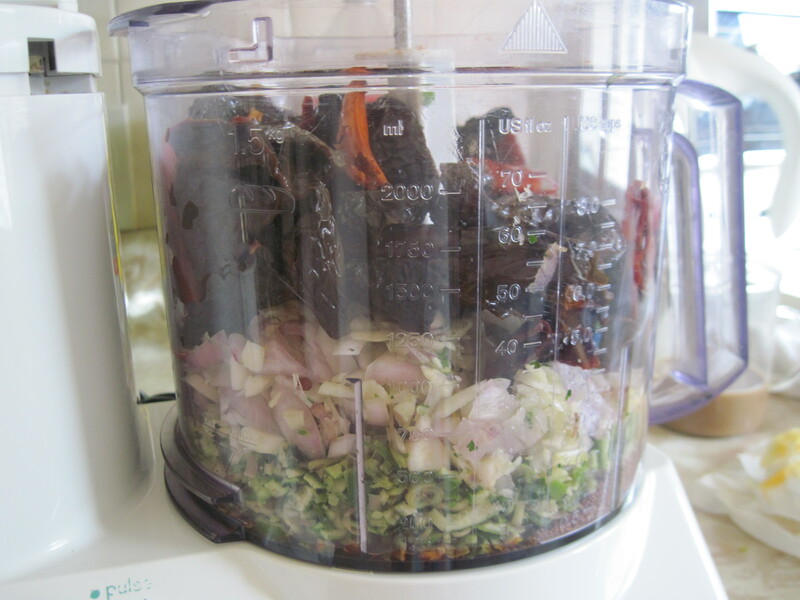 Add the chilies to the food processor. Process the ingredients until a rich, moist paste forms, stopping occasionally to scrape down the sides of the work bowl. Add a few tablespoons of the chili-soaking liquid now and then, if needed to ease the grinding. This paste can be stored in an airtight container in the refrigerator for 1 month, or in the freezer for up to 3 months. This entry was posted in Miscellaneous stuff / Pozostałe Rozmaitości and tagged Thai. Bookmark the permalink.